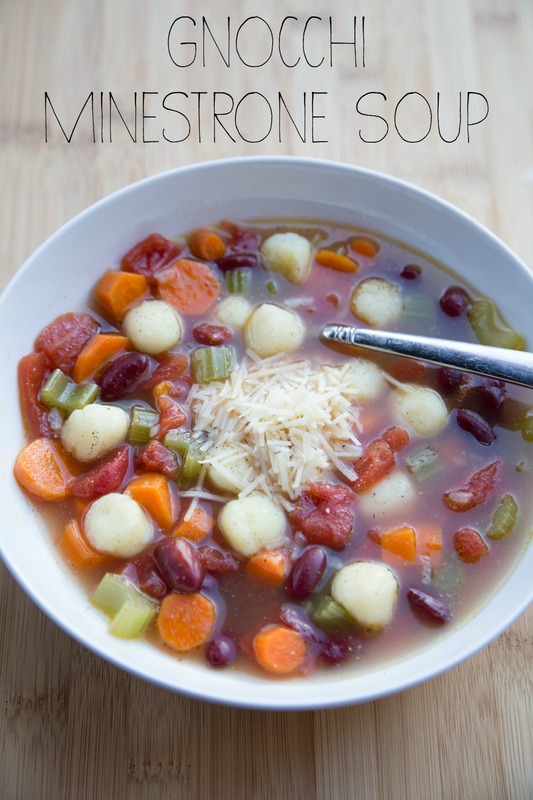 This one below is a typical minestrone soup that uses gnocchi in place of pasta. A few weeks back, I found a 2 pack of 24 oz. gnocchi bags at Costco for $5.99. That makes 4 meals worth for us and it significantly less expensive that what I see at my grocery store. So…I bought a pack and dropped them into the freezer. I made Gnocchi Mac n Cheese. And now this Gnocchi Minestrone Soup. If you’ve never cooked with gnocchi, first you need to know this…they are super “adorable.” They are just these adorable and cute little round balls of potato goodness and you need to try them. The cook up REALLY quickly…like just takes 1-2 minutes for them to cook. That’s another reason they are “adorable”…because they make getting dinner on the table super fast! To cook them, you boil water in a saucepan and then drop them into the boiling water. I usually drop in a “single layer” into the saucepan, so however many will fit in a single layer on the bottom of the pan, that’s how many I cook at once. Once they are cooked, they will float up to the top of the water. Then you fish them out with a slotted spoon and set them on a plate with towel to dry off. Repeat until you’ve cooked however many you need for your meal. A quick note about this soup: Because of the starchiness of gnocchi, it lets off a bit of starchiness/foam into the cooking water. I recommend cooking the gnocchi in a separate saucepan, and then add them to the soup just before serving. Gluten Free Modification: Use GF potato gnocchi. Dairy Free Modification: Omit the garnish. In a large saucepan, melt the butter and saute the chopped onion, chopped celery, chopped carrots and crushed garlic cloves for 4 to 5 minutes. Stir in the diced tomatoes, drained red kidney beans, and Italian seasoning and bring to bubbling. Pour in the chicken or vegetable stock and bring back to boiling over medium high heat and let cook for about 10 minutes. Meanwhile, in a separate saucepan, cook the gnocchi. Once cooked, set aside on a plate to dry. Just before serving the soup, add the gnocchi to the soup. Season with salt and pepper to taste. Spoon into serving bowls and top with Parmesan cheese. 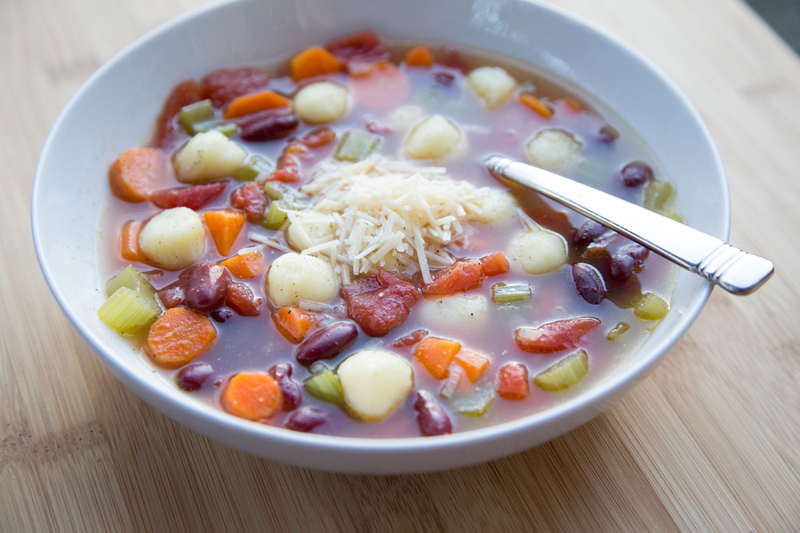 Serve Gnocchi Minestrone Soup with Parmesan cheese garnish and a side of fresh veggies.